How Ending In Success Demands The Right Beginning - Motivate Amaze Be GREAT: The Motivation and Inspiration for Self-Improvement you need! 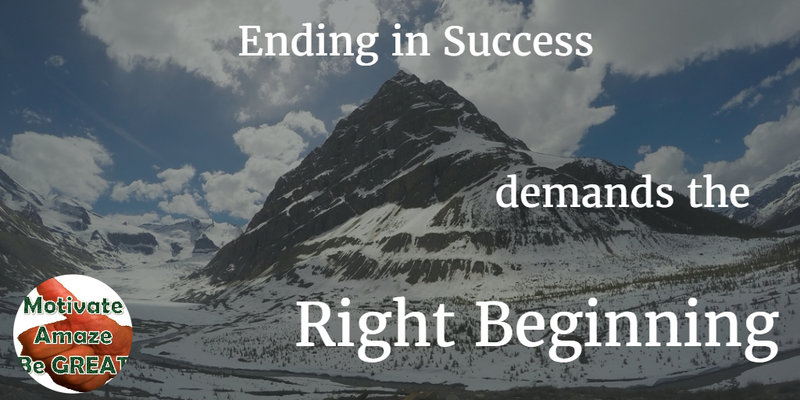 To be truly successful you first have to establish where you want to end up and why. When people in today's world think of success they usually think in terms of money, fame,or power. But are these what you really want, or are they merely means to an end. When I was a child all I could talk about is how I wanted to be a millionaire. Yet as I grew older I came to understand that in my case it wasn't the money I wanted at all. What I wanted was the ability the money would give me to help people. I quickly learned that there were ways to help people with other people's money or no money at all ! To be successful what have to do first is to do some hard thinking about what it is you really want. Many years ago they came up with what is know as the “tombstone test.” The idea behind this test is simple. In one short phrase define what it is you want to be remembered for. Do you want to be remembered as someone who changed lives in your community ? As a military person who did great things defending our country, or the person in your high school class with the shiniest car at the reunion. Francis Chan the author and preacher expressed much the same idea when he said. “Our greatest fear should not be of failure, but succeeding in things in life that don't really matter.” Chan lost both his parents, and an aunt and uncle while growing up. This, as you would expect, profoundly affected his idea of what is and is not important. But that's Francis Chan. You on the other hand have to decide for yourself what really matters. Nobody else can do this for you. What makes this so important ? Because if you do not start out with an understanding of who you are at your core and what deep down inside you want out of life, you could waste years chasing the wrong targets, the wrong ways! This is why I teach that you have to make the right beginning. Self actualization and self fulfillment are grounded in self knowledge. The best part of this, is that everyone has this process within their scope. What I describe is not an easy or quick process. To be effective it requires a lot of deep, hard thought. However you can do it ! If you make the effort your chances of true success will be greatly increased! The best way of doing this is to think about what makes you the happiest. Is it your family? A sport or hobby? Going to a lot of social events? What are you good at? Does this make you happy, or give you a sense of satisfaction. One of the questions I have always asked myself is, would I do this job, project etc. for free? If not is it really part of making me successful or am I just getting by? Am I just making everybody else happy? There are a lot of rich, powerful miserable people. They have a lot of things that most of us would envy. But how can misery equal success? It cannot, because misery can produce neither satisfaction or happiness. So I encourage you to begin your journey to success with an equally important journey of self discovery. Your efforts will be strengthened with greater clarity that those around you. You will be happier and more self satisfied. You will have success deep down and not just on the surface like most people. Like this article? Share it with your friends and colleagues using the sharing buttons so they too can understand how ending in success demands the right beginning.